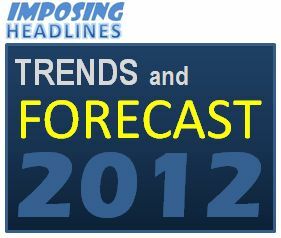 As we enter in year 2012, there have been many speculations made for this year earlier in the last days of 2011. Here is an interesting 'forecast' of how many see 2012 in the political plain of Europe. DOMINIQUE JACKSON talking of Social Media says:"Social Media, or the open web as I prefer to call it, will become more and more prevalent and increasingly important – whether in news breaking, news gathering, riot-organising or in new, communal forms of entertainment." DONAL BLANEY, Young Britons Foundation on EU predicts:"The New Year will finally see the economic slaughter by the markets of the EU states known by the charming acronym of PIGS. Portugal, Italy, Greece and Spain (and maybe Ireland) will cease to remain members of the Eurozone as Germany's Chancellor fails to do what needs to be done." Read Mail Online fro more interesting predictions and even more details on above.